Prior to the new rules implemented by the Trump administration to strengthen work requirements for the Supplemental Nutrition Assistance Program (SNAP), some Republican governor-led states had already begun implementing restrictions and eliminated the practice of submitting "geographic area waivers." Geographic area waivers involve lumping higher unemployment areas and counties with lower unemployment areas in order to meet the criteria to eliminate the work requirement. One far-left political advocacy organization, Center on Budget and Policy Priorities (CBPP), has been aiding states with the waiver process – a concern raised by Rep. Jim Jordan, R-Ohio, who held a hearing last year on the matter. Prior to the SNAP rule change, U.S. Department of Agriculture (USDA) Secretary Sonny Perdue advised states to review their "waiver policy choices concerning when and where to request" them; stating: "It’s time to rethink the use of waivers and support movement to self-sufficiency for these individuals." In Fiscal Year 2016, about 3.8 million able-bodied adults without dependents (ABAWDs) received SNAP benefits, including 1.7 million who lived in states or areas that had waivers of the work requirements and were excused from the time limit established by law, the USDA reports. The law requires ABAWDs between the ages of 18 and 49 to work and/or participate in a work program for at least 80 hours per month in order to receive SNAP for more than three months in any three-year period. Of the 18 Republican-led states contacted by Watchdog.org, several had already begun reviewing their application process, increased work requirements and dropped counties that had previously received waivers. The eight Republican-led states that did not respond to several requests for comment were Arizona, Maryland, Massachusetts, New Hampshire, New Mexico, North Dakota, Ohio, and Vermont. Doug Hogan, a spokesperson for Kentucky’s Cabinet for Health and Family Services, told Watchdog.org, "While this was a practice that occurred during the previous administration, the Bevin administration put an end to this relationship and practice as soon as it was identified. "The Bevin administration has removed the waiver for SNAP work requirements, with the exception of eight counties that were in a Food and Nutritional Service (FNS) employment and training pilot. We did not want to impact the scientific integrity of the study in that pilot but those counties will also lose the waiver status at the conclusion of the pilot." Idaho already implemented a "Mandatory Work Program, which goes above and beyond the ABAWD requirements indicated in the letter received from Secretary Purdue," Kristin Matthews, a spokesperson for Idaho’s Department of Health and Welfare, told Watchdog.org. "Since Idaho re-implemented the Mandatory Work Requirements after the recession in 2013, the state has seen nearly a 30 percent decrease in the able-bodied adult population receiving SNAP benefits," she added. All individuals who meet the ABAWD criteria are still required to participate in the work and training program; those who don’t do not receive benefits. The state also utilizes the Employment and Training funds through SNAP to provide Career Technical Education and college programs to help recipients obtain certificates and training. In Michigan, prior to Jan. 1, 2017, all counties were eligible for geographic area waivers. Since then, the state began removing counties from the waiver eligibility, a spokesperson from former Gov. Rick Snyder’s Office told Watchdog.org. Former Republican Gov. Nathan Dean of Georgia came under fire by local media for his administration’s commitment to enforcing federal work requirement guidelines and enacting even stricter ones – some of which were resolved by the court. John Vaughan, Dean’s spokesperson, explained that from fiscal years 2016 to 2018, Georgia strengthened its work requirements by 50 percent. The number of counties subjected to work requirements in 2016 was 60, compared to 90 counties in 2018. Vaughan also said that while the state receives free data from CBPP, "it is in no way determinative." Georgia uses its own data to follow the federal mandate. However, the Foundation for Government Accountability argues that Georgia was using "fuzzy math" and old data to determine its calculations. Disputes about the state’s use of waivers will most likely continue into the new administration, which begins next week. Utah, like Georgia, does not rely on CBPP data when it has submitted waivers in the past. Jon Pierpont, executive director of Utah’s Department of Workforce Services, told Watchdog.org that "the state of Utah believes in the dignity of work and supports policies that help its citizens become more economically stable." He explained that the department analyzes county economic data from its internal labor market information team and CBPP data, but its ultimate decision is based on the state’s analysis. "For example, Utah only has one county currently with a SNAP ABAWD waiver even though the CBPP’s data shows eight counties being eligible, Pierpont added. The Nevada Department of Health and Human Services also stated that it’s used CBPP data for approximately eight years but analyzes each county’s unemployment data independently and CBPP data is not a determining factor. The effect of SNAP participation rates on state economies is striking, Bill Bergman, Director of Research at the policy organization, Truth in Accounting, told Watchdog.org. Participation rates have "generally risen across the 50 states since 2009" even though "we've had a significant economic recovery since then," he said. "Looking across the 50 states, states with relatively high recoveries in their unemployment rates since 2009 (the deepest part of the recession) tend to have lower increases in SNAP participation, which makes some sense if unemployment drives the rationale for SNAP," Bergman explained. "The tendency isn't ironclad, however," he added. "One thing that helps explain things further is how extensive collective bargaining agreements are in covering workers in states. Relatively unionized states have higher SNAP participation increases than what might be expected given trends in unemployment, which could be consistent with union influence working to diminish competition in the market for labor." 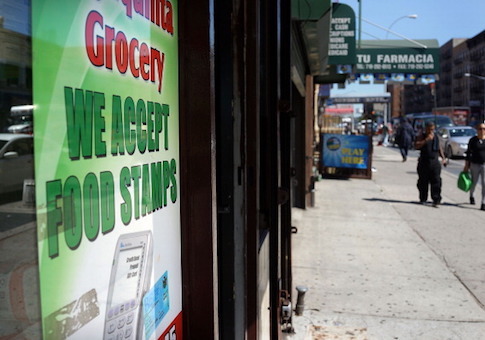 Josh Archambault, a senior fellow at Massachusetts’ conservative think tank, the Pioneer Institute, pointed to federal data that "shows that today, nearly 70 percent of able-bodied adults on food stamps are not working in Massachusetts. And that is during what may be the hottest job market in decades, with over 140,000 open jobs. Statewide unemployment stands at a mere 3.5 percent. Within the regions where the work requirement waiver applies, unemployment rates are about the same or lower. For example, Methuen’s unemployment rate is 3.5 percent and North Andover’s is a mere 2.6 percent. Yet, we are waiving the work requirement in a community where unemployment is 2.6 percent. "It is the perfect time for Governor Baker to look at this issue and change course for the sake of enrollees," he added.